Personal Hotspot allows you to turn an iPhone or cellular equipped iPad into a wireless router, thereby sharing the devices internet connection with other Mac, Windows PC, iOS, Android, or any other capable hardware that connects to the hotspot. Often called “internet tethering” or simply Wi-Fi Hotspot, this is an excellent feature for telecommuters and travelers in particular, and it’s also a great backup internet connection if a home or work network temporarily goes down. Plus, with the ever increasing range of LTE and 4G service, it’s not uncommon for a cellular connection to actually be faster than standard DSL or a cable modem anyway. Widely supported, the only real requirement for using Personal Hotspot, other than an iPhone or 4G/LTE iPad, is a cellular data plan from a carrier that offers the service. Fees vary per provider and per area, so you will need to check with your specific cell carrier if you are not sure what it costs to use, or how to order the feature for your data plan. Surprisingly simple to use, here’s exactly how to turn on internet sharing, and turn an iPhone or LTE iPad into a router for other computers or devices to connect to. Also, we’ll show how to change the default password for the connection, and how to connect to the hotspot from another device. Yes it’s that simple to use. Whatever device becomes connected to the iPhone or iPad will treat it as a normal wireless router and use it’s internet connection as usual, never knowing the difference. The iPhone/iPad will display a blue status bar indicating Hotspot is on and devices are connected to it’s internet connection. Connecting through wi-fi is by far the easiest way to use the iOS devices internet service, but you can also connect through Bluetooth if desired, which is often slightly slower, or through a tethered USB connection, which is often the quickest and has the advantage of also charging the iPhone or iPad, but it’s disadvantaged by the physical USB attachment between the devices. Most carriers place a five device limit on Personal Hotspot use, so be aware of that and don’t try to provide the entire officer neighborhood with an internet connection through your cell phone. When you are finished using the iPhone/iPad internet connection, go back into Settings and toggle Personal Hotspot back to OFF. This will stop broadcasting the wi-fi and Bluetooth signal as a hotspot, and also save some battery life. 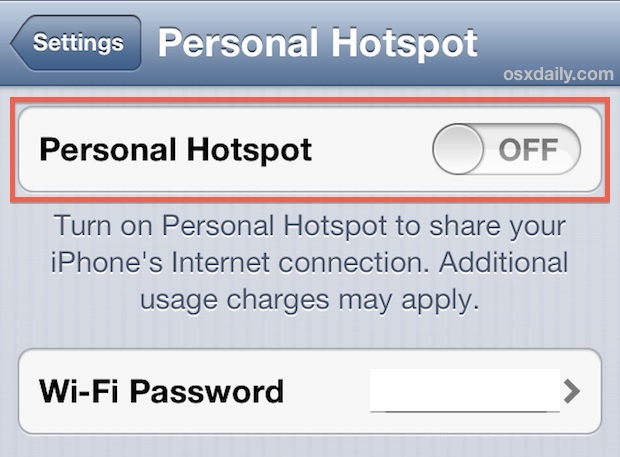 Why isn’t “Personal Hotspot” showing up on my iPhone or iPad? 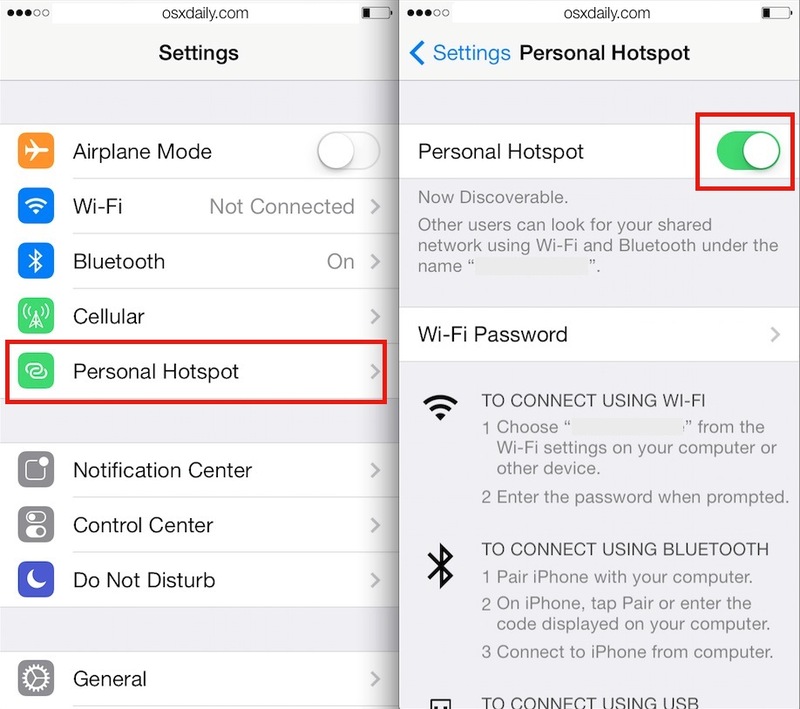 Don’t have the Personal Hotspot setting on your iPhone or cellular iPad? There’s a few possible reasons for this. First and foremost, not all carriers support the feature, so you will want to be sure that your cell provider does offer personal hotspot and internet tethering. Many carriers will either charge an additional fee to use the hotspot ability, or require a separate data plan in order to use the feature. On the other hand, if you know for sure that you do have support for internet sharing on your iPhone or iPad with a data plan to support it, but Personal Hotspot has mysteriously disappeared, you can often just reset the devices network settings to bring it back into the Settings menu. Then just flip it on again as usual to get going. Until you get an idea for how much data you use in an average hotspot session, it can be very helpful to tap the “Reset Statistics” setting at this menu each time you start a tethered or personal hotspot session, that way you can know exactly how much data is being consumed. You can take further steps to conserve and reduce data usage when connected to Personal Hotspot, we cover 10 excellent tricks here to help keep data usage low when tethering to an iPhone or iPad, and they range from disabling automatic updates for a variety of apps and OS’s, to turning off cloud and Dropbox syncing. Don’t have an iPhone or iPad? No big deal, because Android can also do this and share it’s internet connection easily too. The same data usage rules apply for Android though, so always remember to keep an eye on your data plan regardless of way device is being used.